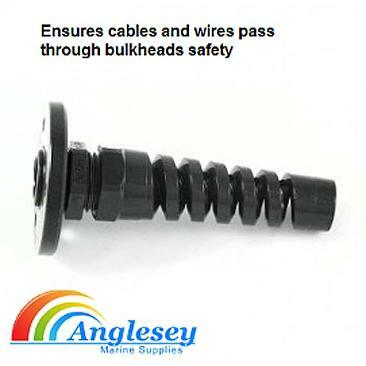 Anglesey Marine Supplies...supplying a full range of outboard control cables and outboard control boxes for most outboard engines including Evinrude, Mercury, Mariner, Honda, Force Sterndrives. 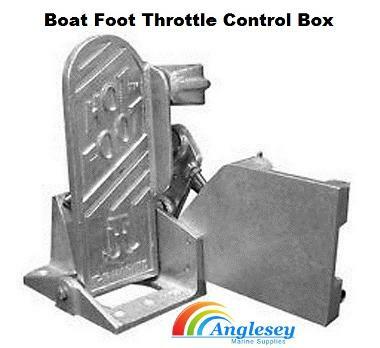 Now supplying the Hotfoot boat throttle control for most outboard engines, a unique foot operated boat throttle control. 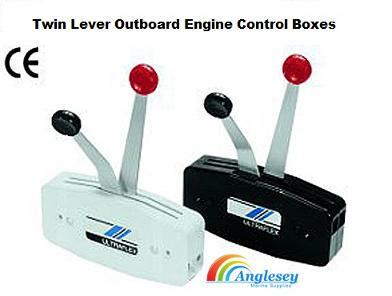 We also supply outboard engine control boxes-single lever and twin lever boat outboard remote control steering boxes in plastic or stainless steel. 33c control cable, c2 and omc. Full range of outboard controls. 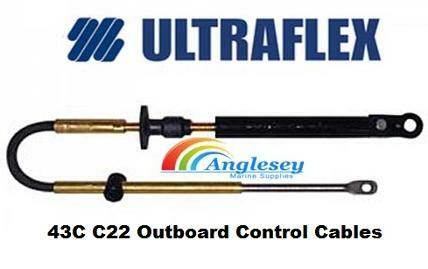 Outboard engine control cable 33C C2 use drop down bar for sizes and prices. 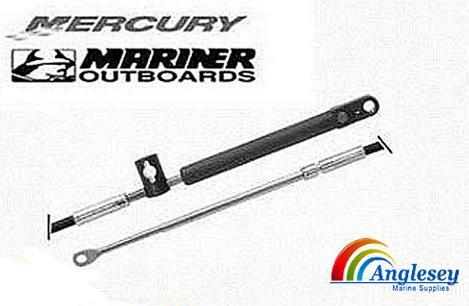 Mercury Mariner outboard engine control cables, large range of sizes available (please use drop down bar). OMC O Type outboard engine remote control Cable throttle and gear change cables, various sizes available, please use drop down menu bar for size choice. 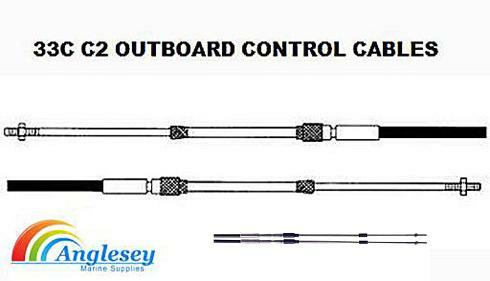 C8 Heavy duty outboard engine control cables, available in a range of sizes, please choose size from the add to cart drop bar on the right. 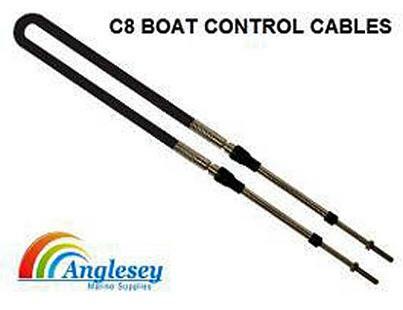 Same outboard engine cables as mach zero, use the c8 control cables for throttle and gear control on outboard engines. 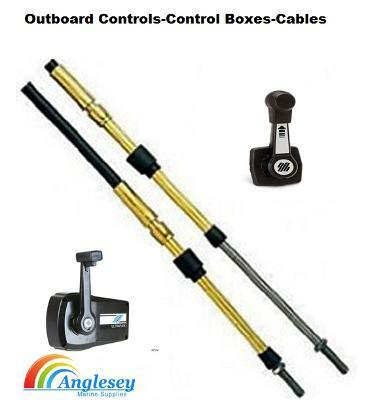 43C or C22 boat outboard engine control cables throttle and gear remote control cables, designed for commercial use, heavy duty for more severe loads, please choose boat control cable length from drop bar on the add to cart button. Quality heavy duty outboard engine cables. 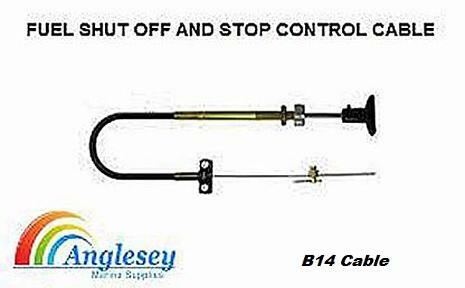 B14 control cable for boat throttle fuel shut off and choke, diesel stop and other applications. Supplied with black “T” bar handle, clamp and shim, and trunion connector. Ideal for boat builders and also kit car enthusiasts. Please use menu for length choice. A quality boat fuel shut off and choke cable. Boat steering control cable witches hat and remote control cable protector, grommets, predrilled grommet to accept 3 self tapping screws. 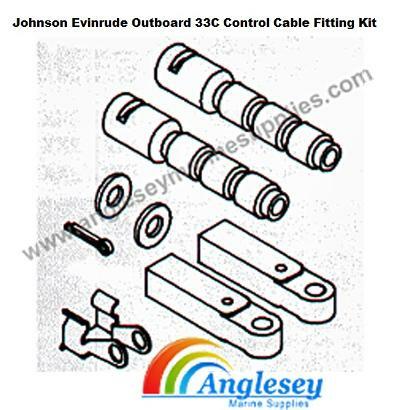 Bulkhead wiring and outboard engine control cable protector hose kit for protecting hydraulic and boat control cables and distributes strains from bends. Ensures control cables, boat wiring and hydraulic steering cables pass through the bulkheads safely, prevents scuffing on panel edges. Single lever Outboard engine control box ,combining throttle and gear control in one movement. Will accept all Control cables except old "o" type OMC Cables. Will also need an Adapter to fit Mercury outboard engine control Cables (sold on this page). Available in either black or white. Trem twin lever outboard engine control box, will fit directly to mercury outboard engine cables without the need for special adapters. The twin lever control box allows separate operation of throttle and gear selection. 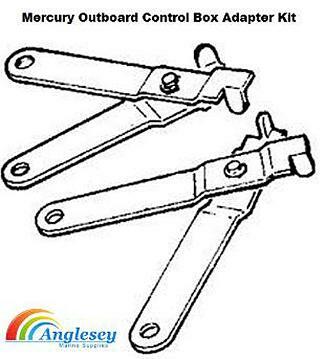 Mercury outboard engine Control Box Adapter to fit the above outboard engine control box to enable the use of Mercury Outboard Engine Cables. Twin lever outboard control box. 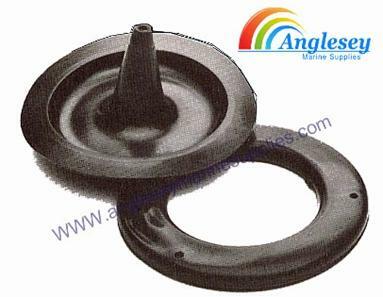 Comes with all the necessary outboard engine cable fittings, for use with only 33c C2 or C8 outboard engine control cables sold on this page. Chromed finish. Suitable for boats with twin engines. Single lever boat controls. Comes with all necessary cable fittings, for use with only C2 or C8 cables. Chrome finish, single engine. The outboard engine control box is top mountable, on boat console etc. 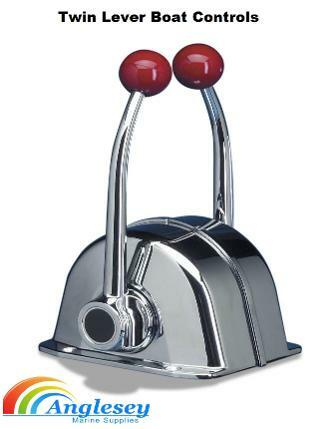 Twin lever outboard engine control box stainless steel. Each lever operates gear and throttle separately. For use with outboard engines, inboard engines and stern-drive power plants. To use C2, C7, C8 etc cables. 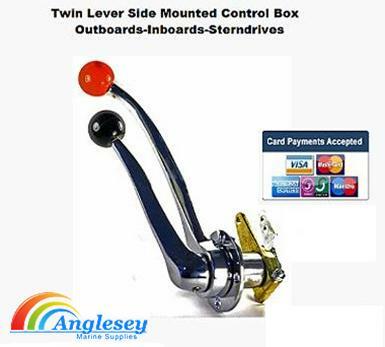 The twin lever outboard engine control box comes with outer control cable anchor points and connectors. 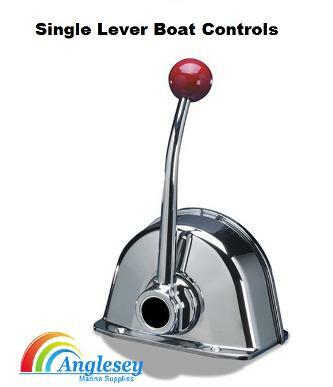 Single lever outboard engine boat controls / dual action control to operate both outboard engine throttle and gear. Suitable for any type of boat with outboard engine, inboard or I/O power plants. 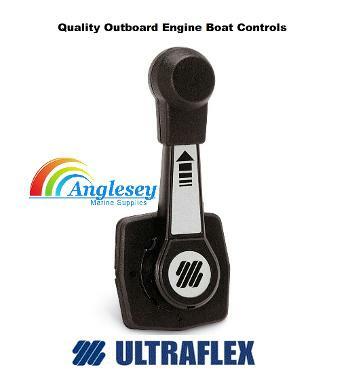 For use with all Ultraflex outboard engine control cables. The boat control box is virtually flush mounted. 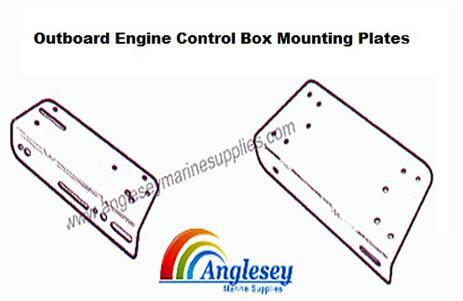 316 Marine grade stainless steel outboard engine control box mounting bracket, two different sizes available. The smaller of the two (3515) is for single lever outboard engine control box and the larger (3516) is for twin lever boat control boxes. Please use drop menu for choice. This is the original Hot Foot Boat Control Box For Throttle Control that has been on the market for 20 years. 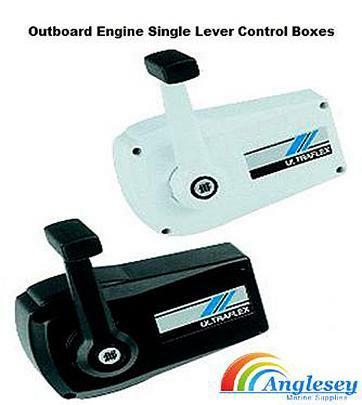 Improves throttle control for all outboard engines and inboards. Aluminum casting to reduce weight and resist corrosion. Stainless steel hardware and non-sticking Teflon® or nylon bearing surfaces for trouble-free operation. A stainless steel spring returns engine to idle position when released. Equipped with toe clip for additional safety in extreme operating conditions. Provisions for additional return springing if required. Uses standard Outboard Engine control cables for easy hook-up. Mounts directly to floor of boat with four screws (not included). 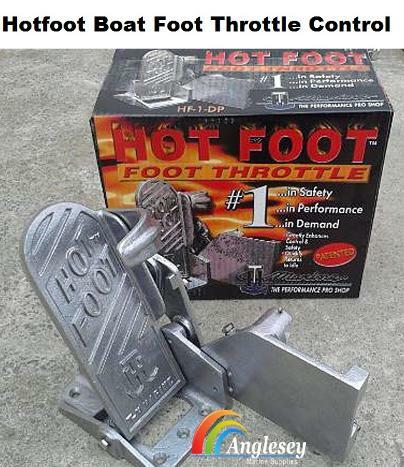 Introducing for the new season the HOTFOOT boat foot throttle control pedal. Manufactured from Aluminium and Stainless steel for the ultimate in corrosion protection. 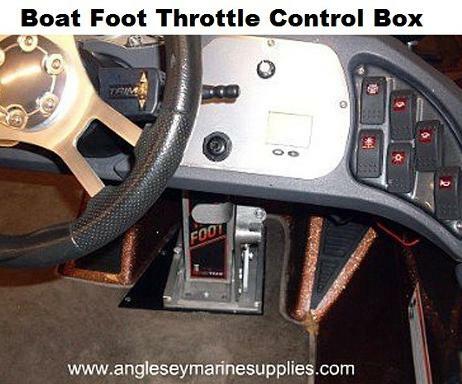 The hotfoot boat foot throttle control gives better response. 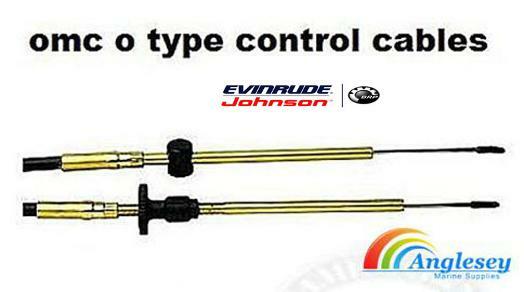 Johnson Evinrude OMC outboard engine control cable fittings remote cable "C" clamps. A pair of OMC remote cable "C" clamps in stainless steel for Johnson / Evinrude snap in cables. All HP engines from 1963 to 1988. Sold in pairs. 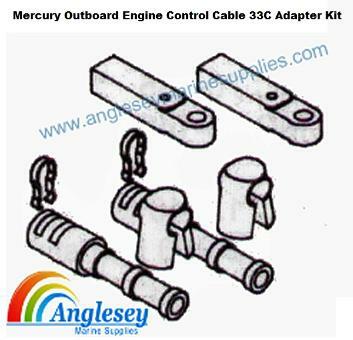 Mercury Outboard engine control cable end fitting adapter kit to enable 33C ( C2 ) cables to fit Mercury outboards engines. 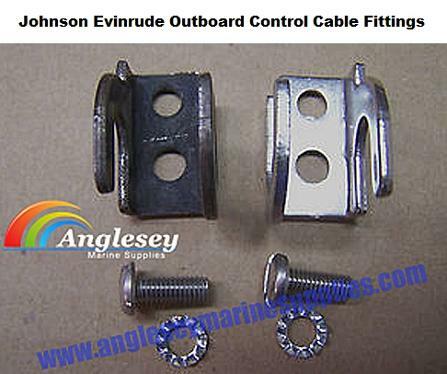 Outboard engine control cable adapter fitting kit to enable 33c ( C2 ) control cables to fit OMC Johnson Evinrude outboard engines.